High-grade material is tough, durable, wear-resisting and anti-dropping. 2.4GHz frequency provides remote controlling distance, fast reaction and strong anti-interference abilities, supporting multiple drones simultaneously. Headless mode and one key to returning function provide free flying and safe returning without orientating. 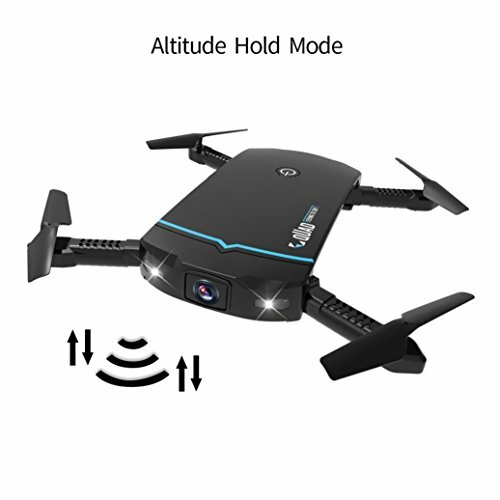 Altitude hold mode ensures stable flight and precise height holding. 360° rolling and rotating for cool flying. HD wifi camera can shoot 720MP photos or videos. Track flying via phone can let you enjoy virtual flying experience. Foldable design with light weight is convenient to carry and store. one key to taking off and landing is easy to operate. High / medium / low speed mode with stable 6-axle gyroscope has strong wind resistance ability, which can switch high speed mode to meet strong wind. High-grade material is tough, durable, wear-resisting and anti-dropping. 2.4GHz frequency provides remote controlling distance, fast reaction and strong anti-interference abilities, supporting multiple drones simultaneously. 360° rolling and rotating for cool flying. HD wifi camera can shoot 720MP photos or videos. Headless mode and one key to returning function provide free flying and safe returning without orientating.